With OverDrive Read, you can read borrowed ebooks and magazines right in your web browser with a single click. There are no downloads or software required. OverDrive Read is a browser-based reader that works on most computers, tablets, and mobile devices running web browsers with HTML5 support. How do I start using OverDrive Read? To get started, open your web browser and borrow a title that's available in the OverDrive Read format from your library. Then, click or tap the Read now in browser button to begin reading it immediately using OverDrive Read. Note: You won't see this reading option in the OverDrive app unless the title is only available in the OverDrive Read format. As long as you have an internet connection, you can close an OverDrive Read title and pick up where you left off later on any compatible device. Will OverDrive Read work on my device? The easiest way to see if OverDrive Read works on your device is to try it out using the sample below. Just click or tap the cover image. Most current web browsers are compatible with OverDrive Read. Some browsers that work well are Chrome, Firefox, Safari, Internet Explorer 11, and Edge. What are some of the features of OverDrive Read? OverDrive Read has many of the same features as popular reading apps and ebook readers, like the ability to add bookmarks, search for terms, add notes and highlights, look up words, and change the font. It also offers some extra features, like fixed-layout support for graphic-heavy titles and professional narration for some ebooks. Can I use OverDrive Read without an internet connection? Yes, in most cases (but you'll need to download the content first). 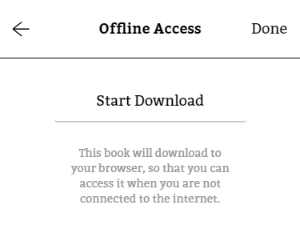 On most devices, select Offline Access from the OverDrive Read menu, then Start Download to download the book for offline reading. Make sure to also bookmark the ebook in your browser or save the ebook's URL so you can access it in your browser once you're offline. Note: Some titles, like read-alongs and magazines, are too large to completely download in your browser. With OverDrive Read, you can borrow ebooks and read them right in your browser with a single click. There are no downloads or software required. OverDrive Read is a browser-based ebook reader that works on most computers, tablets, and mobile devices running web browsers with HTML5 support. 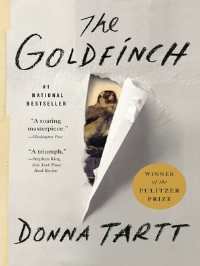 To get started, borrow an ebook that's available in the OverDrive Read format from your library. 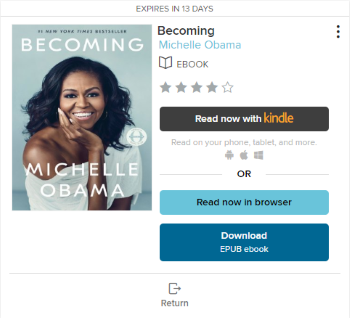 Then, click or tap the Read (In your browser) button on your Checkouts page (under your Account) to begin reading it immediately using OverDrive Read. As long as you have an internet connection, you can close an OverDrive Read ebook and pick up where you left off later on any compatible device. OverDrive Read has many of the same features as popular reading apps and ebook readers, like the ability to add bookmarks, search for terms, add notes and highlights, look up words, and change the font. It also offers some extra features, like fixed layout support for graphic-heavy ebooks and professional narration for some titles. Note: Some ebooks, like read-along ebooks, are too large to completely download in your browser.